ASSEMBLY (12.2.2.2.5, and 7.2.1.6.2) allows access-control egress doors in compliance with 7.2.1.6.2 (Except when the building is occupied, the locking system shall be disabled). BUSINESS (38.2.2.2.5, and 7.2.1.6.2) allows access-controlled egress doors in compliance with 7.2.1.6.2. (28.2.2.2.3, and 7.2.1.6.2) allows access-controlled egress doors in compliance with 7.2.1.6.2. (36.2.2.2.5, and 7.2.1.6.2) allows access-controlled egress doors in compliance with 7.2.1.6.2 in buildings protected throughout by a supervised fire detection system or an approved sprinkler system. (40.2.2.2.3, and 7.2.1.6.2) allows access-controlled egress doors in compliance with 7.2.1.6.2. (42.2.2.2.3, and 7.2.1.6.2) allows access-controlled egress doors in compliance with 7.2.1.6.2. 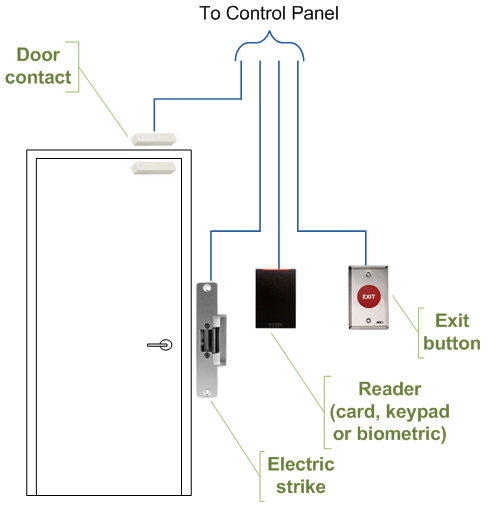 Access Controlled Doors are electronically controlled by an access controller combined with some form of reader to identify people by their ‘credentials’. This may be a keypad, a card reader or a biometric reader. Together, the access controller and the reader provide the ability to identify an individual and authorize or deny entry to them. A-C-Doors shall unlock by an approved sensor that detects an approaching occupant on the egress side of the door. A-C-Doors shall unlock on loss of power to the sensor and/or on loss of power to the access control system that locks the door. A-C-Doors shall unlock by manual release button on wall adjacent to the door. Button to be readily accessible and clearly identified with signage that reads: PUSH TO EXIT. A-C-Door unlocks on activation of building fire protective signalling system, any smoke/fire detection system, and/or sprinkler system. Doors to remain unlocked until protective system is reset.